The ultimate Trader Joe’s shopping hack: Don’t shop at Trader Joe’s. Slate’s secret T.J.’s shopping hack, explained. 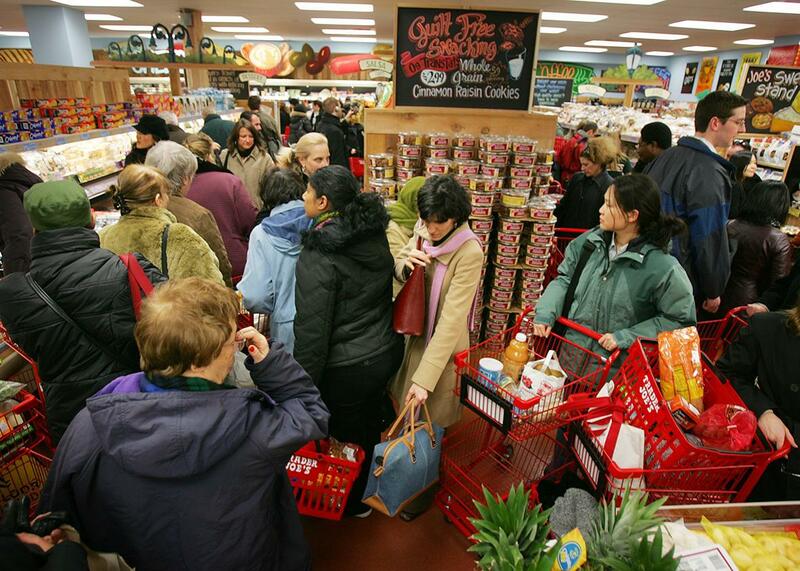 Shoppers line up at Trader Joe’s in 2006 in New York City. We all know that shopping at Trader Joe’s can be a hassle. The checkout lines are very long, especially in major urban areas. People get stressed out. They say “excuuuuse me” in a mocking tone when you bump into their carts. They threaten you with violence. They slap your husband’s face for grabbing the last box of frozen vegan pad Thai. Sometimes you even have to wait in line just to get inside the store. Saturday night? It’s like a velvet-rope nightclub. Sunday afternoon? The customers outside are taking selfies to commemorate the madness. Once you’re in the store, you’re faced with several thousand options—frozen entrees, tubs of snacks, pouches filled with prechopped vegetables, so many types of cheese. Which to buy, and which to skip? How best to use your precious, hard-earned time in Trader Joe’s? “Look for the days or times when the store is least crowded,” says the Kitchn. “Compare prices before you purchase,” says Pop Sugar. “Shop for health- and environmentally-conscious goods,” says the Huffington Post. “Snag some bananas,” says Business Insider. Here’s one more, this from Estee, a friend and seasoned T.J.’s shopper. She swears by the one-third/two-thirds rule of Trader Joe’s: Do one-third of your shopping before you get in the checkout line, and then collect the rest of what you need as you make your way toward the register. Don’t shop at Trader Joe’s. Sounds pretty simple, right? Instead of weathering the hail of elbows at your local T.J.’s, go to a different store, without a hail of elbows. Instead of waiting in a line that wraps around a city block, go to another store, without a line. Instead of fighting through the crowds only to find that T.J.’s has sold out of organic milk, go to a store that isn’t Trader Joe’s, with no crowds and lots of organic milk. Instead of planning out your day to find the perfect time to go to Trader Joe’s, just close your eyes and say these words out loud: Don’t shop at Trader Joe’s. Then say them again: Don’t shop at Trader Joe’s. Don’t … shop … at … Trader Joe’s. A true T.J.’s aficionado will quickly spot some problems with my life-hack. “If I don’t shop at Trader Joe’s,” this shopper might inquire, “then how will I get all my groceries from Trader Joe’s?” Of course I had the very same question. Among the major selling points of Trader Joe’s is its extensive line of gourmet, house-brand products, including cult, private-label favorites such as Trader Joe’s speculoos cookie butter and Trader Joe’s frozen mac ’n cheese. So how indeed could a shopper like myself get these products into his kitchen—I mean, without going to Trader Joe’s? It turns out that one of the best and most surprising things about the don’t-shop-at-Trader-Joe’s approach is its radical versatility. Instead of going to Trader Joe’s, one can go to any number of stores selling any number of foodstuffs. What’s more, it’s been well-established that plenty of Trader Joe’s private-label products are identical to regular commercial brands. Do you like Trader Joe’s pita chips? They’re the same as Stacy’s pita chips—and Stacy’s pita chips are available at lots of stores that are not Trader Joe’s. Do you like Trader Joe’s organic shells and white cheddar? You can buy them across the street, not at Trader Joe’s, where they’re called Annie’s organic shells and white cheddar. Do you like Trader Joe’s organic yogurt? If you’re in New York City, it’s also known as Stonyfield organic yogurt. Even when Trader Joe’s products don’t match up exactly with non–Trader Joe’s products, one can often find a near equivalent. I’ve heard paeans to Trader Joe’s sunflower seed butter—an absolute must-have, I’m told, in today’s peanut-panicked school environment. But at my local Key Food supermarket, the one that’s half a block away from Trader Joe’s, I found a non-T.J.’s jar of sunflower seed butter. I also found some bags of frozen veggie gyoza, which were not the same as—but really not that different from—Trader Joe’s famous Thai vegetable gyoza. (At Key Food, these were called “dumplings.”) I even found a fancy-looking “European cookie spread,” pretty much a doppelgänger for T.J.’s speculoos cookie butter. Were these just copycat products, stocked by a competitor in a desperate attempt to catch up with Trader Joe’s runaway success? Probably! But don’t let that bother you. Trader Joe’s, of course, has gone to great lengths to duplicate plenty of leading products from other stores and sell them under private label. In fact, in December Pepperidge Farm sued T.J.’s for confusing buyers of its classic Milano cookie by “mimicking an overall oval shape” with chocolate filling for “Trader Joe’s Crispy Cookies.” It’s only fair for other grocery stores to give T.J.’s a taste of its own medicine (or dietary supplements). Wait, there’s more! Supermarkets that are not Trader Joe’s might even carry their own range of specialty items that you’d never find at T.J.’s. I’m talking about unusual and unique ingredients such as corn meal and dried coconut and nonorganic sugar—none of which are available in the highly curated selection at my local T.J.’s. By not shopping at Trader Joe’s, you’re not missing out on private-label products so much as expanding your horizons. “Hold on,” you say. “Part of what I love about Trader Joe’s is exactly that curation. If I don’t shop at Trader Joe’s, then how will I handle all the confusing colors, fonts, and choices that one encounters in a store that is not Trader Joe’s?” Another good question! T.J.’s does make an effort to simplify your life with sedate package design and a reduced set of options. But how committed is it, really? The last time I checked in, my local T.J.’s was hawking 18 varieties of olive oil. That’s fewer choices than I had at Key Food, but not by much. In any case, I found the choice of olive oils far less disorienting than the surrounding, apocalyptic tableau of shopping-cart blockades and near fistfights. In any case, you should really stop pretending that you shop at T.J.’s for its health food. All the most popular items in the store could be classified as unrepentant junk: ginger snaps, cookie butter, knock-off Oreos, guacamole, cheap wine, mac n’ cheese. As a rule, Trader Joe’s (like other supermarkets) highlights quick-fix, heavily processed foods (chile lime chicken burgers, chocolate coconut almonds, etc) as opposed to more basic items that one might use to make a healthy meal. And although its bags of prechopped vegetables do make cooking easier, one can find those bags at other stores as well. What about organic foods? Hey, it’s true that Trader Joe’s offers a wide range of organic products, often at much better prices than the competition. But, as a rule, these are not any better for your health than conventional options; they’re only more expensive. Organic shopping may indeed offer real environmental benefits, and this planet needs as many benefits as it can get. Still, it’s hard to imagine that your Trader Joe’s obsession really counts as eco-friendly, given that nearly everything in the store is enrobed, encased, or cryopreserved in plastic. If you’d like to do your part for planet Earth, here’s an idea: Don’t buy fresh produce that’s been squeezed into plastic trays and shrink-wrapped. Or, put another way: Don’t shop at Trader Joe’s. While we’re on the subject of health and the environment, let’s remember that Trader Joe’s is among the most secretive supermarket chains in the United States: According to a 2010 feature by Beth Kowitt in Fortune, T.J.’s forces each of its suppliers to sign a contract promising not to “publicize its business relationship with TJ’s in any manner.” In February 2014, the chain settled a $3.4 million class-action lawsuit over claiming products were “all-natural” (whatever the hell that means) when they really weren’t. More recently, Trader Joe’s has gotten dinged for underfilling cans of tuna fish. If you’re the kind of person who cares what’s in your food and where it comes from, you might consider shopping at a business that offers more transparency, i.e., a business that is not Trader Joe’s. OK, I know I haven’t yet addressed the single most important reason people cite for shopping at a crowded Trader Joe’s: It’s so cheap! I mean, not shopping at Trader Joe’s might sound pretty good at first, but how much money will it cost you? To find out, I put together a list of 40 supermarket items, both conventional and organic, and loosely based on a supermarket price survey I found in a recent academic study. Then I compared prices between my local T.J.’s and my local Key Food in Brooklyn. In the end, 28 of the items, or 70 percent of them, were cheaper at Trader Joe’s—and some were a whole lot cheaper. The big winners were frozen strawberries, romaine lettuce, organic canned tomatoes, and conventional butter. Each of these products were available at about half-price at T.J.’s. Meanwhile, three grocery items were the same price at the two stores (fresh mozzarella, spaghetti, nonorganic canned tomatoes), and nine were somewhat cheaper at Key Food, including basics such as organic and nonorganic rice, black beans, tuna fish, flour, and olive oil. That’s an excellent deal, but is it really worth the hassle of the ever-present T.J.’s lines? I went back to each store to see how long it would take me to finish checking out once I’d gathered all my items. On a Sunday evening at Trader Joe’s, I spent about 16 minutes in line for checkout (not including the several minutes it took to muscle my way to the end of the queue). At Key Food, the equivalent wait was less than two minutes. On a second trip, made on a Wednesday afternoon when I figured most nonfreelancers would be at work, it took me six minutes to check out at Trader Joe’s and less than one minute at Key Food. 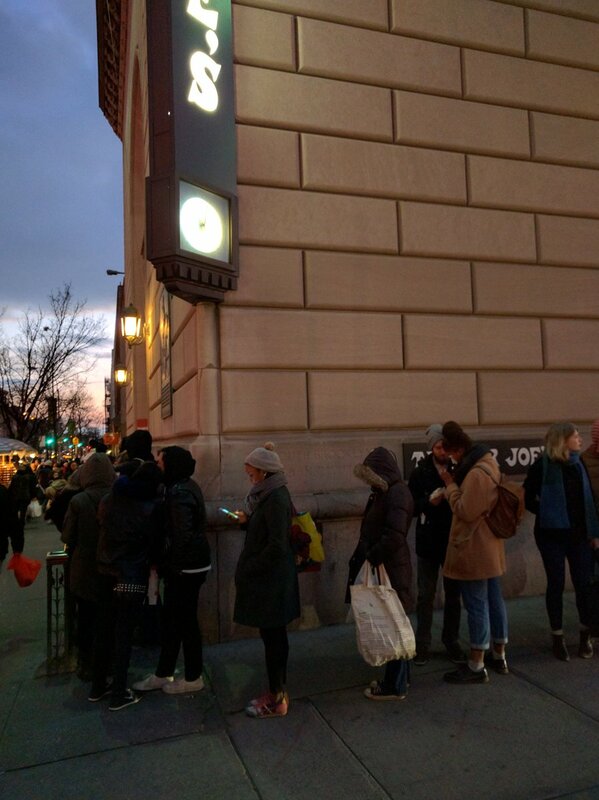 The T.J.’s markup, in terms of time spent on checkout lines, appeared to be roughly 500 to 700 percent. Those extra minutes spent at Trader Joe’s weren’t much fun, either. The store gets a lot of credit for its chatty, Hawaiian-shirted employees and the stickers that they hand out to shoppers’ kids. But these friendly interactions only seem so sweet because they mark the coda to an Orphean journey. The 15 minutes that you spend waiting in the line for Trader Joe’s do not offer you the chance for quiet contemplation. They’re more like heavy labor. So how much is that extra labor worth to Trader Joe’s consumers? According to one recent study, about half of the value-conscious T.J.’s clientele holds at least a bachelor’s degree, and 46 percent make more than $100,000 per year. (For what it’s worth, the median household income in Cobble Hill, Brooklyn, the neighborhood around my local Trader Joe’s, is $116,000.) For someone who makes this kind of money at a standard full-time job, a 15-minute stretch of painful waiting amounts to something like $12 of his or her time. That’s almost certainly more than anyone would save by shopping at T.J.’s to begin with. Which brings me back to my super-secret shopping tip: Don’t shop at Trader Joe’s. I mean, why would you shop at Trader Joe’s? Seriously, you don’t have to shop at Trader Joe’s. Easier said than done, I know. Not shopping at Trader Joe’s might feel at first like a betrayal of your deepest self, like you’ve given up the bargain-hunting foodie lifestyle. But these are just the shakes of an addled T.J.’s addict. Do not be afraid to throw aside your Fearless Flyer. Do not be afraid to amble down the block, across the street, or to your corner store. Do not be afraid to throw yourself into the quiet and the calm.